Download the GAMAR app today to get started! 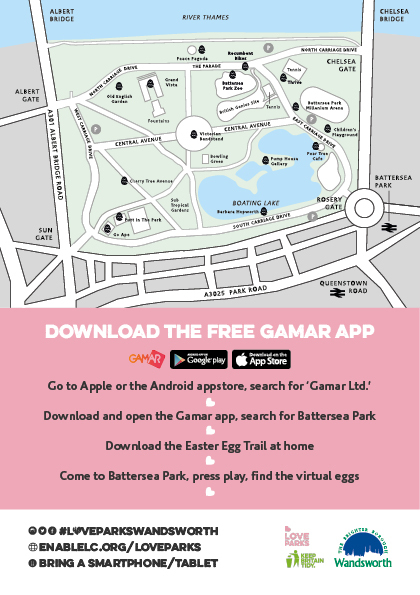 To kick start the campaign, we have a state-of-the-art augmented reality Easter egg trail in Battersea Park this Easter weekend. 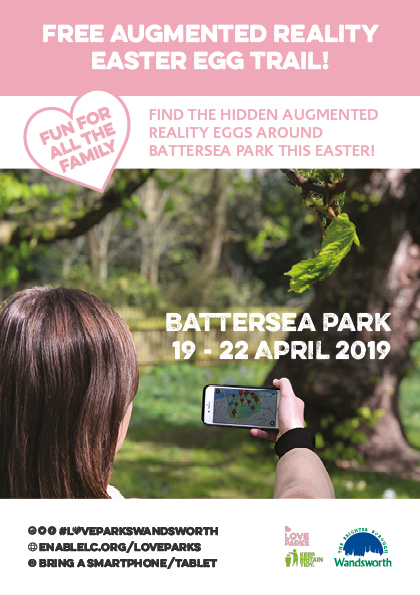 The virtual world will meet the real one at Battersea Park this Easter weekend in a state-of-the-art egg hunt – the first in a summer-long series of events celebrating Wandsworth’s parks. Find key clues and hints beforehand on our Instagram and Facebook page, and keep updated with the latest information. The Battersea Park Easter Egg Trail will signal the launch of a five-month celebration of Wandsworth’s great parks under the #LoveParksWandsworth banner. More than 250 park-related events will be taking place until the end of September as people are encouraged to get out and enjoy their green spaces. Simply go to your phone’s app store and search for ‘Gamar Ltd’. Search for ‘Battersea Park Wandsworth Council’. Press ‘Open’ to download the trail. Come to Battersea Park and press play. To ensure you have the best experience, please bring a full charged phone, and ensure the game has been downloaded beforehand so you are able to get started straight away! While exploring the park on this Augmented Reality Easter Egg Trail, you will be brought to the Go Ape! treetop course. Wandsworth Council are excited to be collaborating with the Go Ape team in the park to provide the full experience of nature during the trail, whilst in Central London. This stop in the course allows you to explore London’s most central forest experience, why not share your experience with us and follow us on Instagram to share your journey on the trail using the hashtag #LoveParksWandsworth. We are excited to work closely with Go Ape in order to provide this family adventure to all. Putt in the Park is a great activity to take part in while in the borough, which allows families to enjoy an alternative experience that is unique to Battersea Park. Visitors of all abilities are welcome to take part in the course, ranging from a golfing newbie to a seasoned pro. During the Augmented Reality Easter Egg Trail, Wandsworth Council have collaborated with Putt in the Park to ensure each member of public taking part in the trail are immersed within the park. We are excited to be working closely with Putt in the Park to provide this family adventure for all, follow us on Instagram to share your journey on the trail using the hashtag #LoveParksWandsworth. As an iconic element in Battersea Park, the Millennium Arena offers a range of activities, courses and classes for both adults and young children. This family-friendly environment provides the ideal location for another key point within the Augmented Easter Egg Trail. From gym memberships to team sports, the locals of Wandsworth are welcome to explore this exceptional facility while on the trail. We are excited to work with the Millennium Arena to provide this family adventure for all, follow us on Instagram to share your journey on the trail using the hashtag #LoveParksWandsworth. * Chocolate eggs are suitable for vegetarians. While every care has been taken to ensure product information is correct, food products are constantly being reformulated, so ingredients, nutrition content, dietary and allergens may change. You should always read the product label.